A woodworm infestation can be one of the most damaging pest control problems for your property. If not dealt with in a timely manner it can even become a serious danger to the structural integrity of your wooden furniture and even your home. If you suspect that you have a problem with woodworm on your property do not delay in getting in touch with PestControl.co.uk for expert advice and solutions. How do you know if you have a current woodworm infestation? One of the most obvious signs of woodworm is of course the tiny holes in the wood. If you notice a hole where you know there wasn't one previously then of course this is an indication that it is a current problem, however if you find them in an old piece of wood then they might be gone already. In this situation it is best to be safe and call for expert advice as to whether it is a current woodworm infestation and to determine the extent of the damage. The technicians from PestControl.co.uk are experts in the use of borescopes, which can be used to determine how much damage has been done by woodworm. Dampness – Woodworm need to get their water from the wood itself so if it is bone dry then it may be that the infestation will have now disappeared, whereas if it is damp at all then it is very probable that it is still an active infestation. Frass or Bore Dust – This is direct evidence of a current infestation. When the woodworm burrows through the wood it creates frass, little bits of dust from the wood. If you find little piles of it beneath the wood or around any holes in the wood then you can be sure that it is an active infestation. Wood Boring Beetles – Something that not everyone knows is that “woodworm” is actually just the collective name for wood boring beetles while they are in their larval stage. That is actually the state in which they live the majority of their life, which can be several years, but when they are ready to breed they turn in to adult beetles and that is when they burrow out of the wood to find a mate. 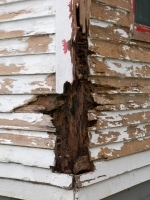 If you find little wood boring beetles on your property, therefore, that is a definite indication of an active infestation. Please remember that this is only a guide. Even if you suspect that the infestation may not be active anymore it is best to get expert advice on the matter as an untreated woodworm infestation can cause major problems to the integrity of wood. The best woodworm treatment will depend on the seriousness of the infestation. If the woodworm has not spread very far or done very much damage then spraying insecticides on the wood may be sufficient. If a faster technique is required then fumigation may be needed. If the woodworm have already compromised the integrity of the wood to a great extent then it may be necessary to dispose of it and replace it with fresh wood. At PestControl.co.uk our technicians are expert at making these determinations and will know the best course of action to take in your situation.